I was born in Fort Nelson, B.C. Canada. My mother is Irish, from Tralee, and my father is a mixture like me, but mainly German. I grew up and went to school in Tepoztlán, Morelos, Mexico. I started my professional musical studies at the Escuela Nacional de Música (UNAM) in Mexico City but my fascination for early music drew me to Europe. I studied voice with Mary Nichols and started to play the renaissance lute under the tutelage of Nigel North at the Guildhall School of Music and Drama in London. Later, at the Hochschule für Musik Trossingen in Germany, I studied voice with Richard Wistreich, and lute with Rolf Lislevand. Finally, at the Schola Cantorum Basiliensis in Switzerland I studied voice with Ulich Messthaler, and lute with Peter Croton. All throughout my studies and after I have had the opportunity to work with brilliant musicians; it has made me grow musically and has influenced my taste and the way I perform. 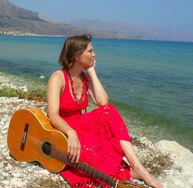 I have experienced singing many different styles, from baroque through classical, medieval, opera, pop, jazz and folk. Additionally, I have performed contemporary music working together with the composers. I work regularly with Peter Croton (lute & guitar), Edoardo Torbianelli (fortepiano) and Michelangelo Rinaldi (piano, oboe, organetto, accordion). Singer-songwriters have my special attention & I perform their music from all the periods of music history, playing guitar, or lute. I also write my own songs, and try to express the need we have to change; especially related to the basic rights of the Earth and human beings. I have many years of teaching experience, 7 of which were at the music school in Rheinfelden; I love to work with groups of people who have the desire to sing, and I enjoy writing new music or arrangements for them. I founded a few vocal ensembles in the last years in Switzerland and in Italy. It is becoming increasingly important in my life to speak through music about important social issues, working together with organizations and creating a network with the help of Music. The desire of having individuals who are more aware and a society which takes care of our environment and all natural resources is the basic force that joins us. The project "La Calle Canta" (The street sings) is about singing and composing songs for street kids within the Mojoca (movimiento de jovenes de la calle/movement of the street youth) in Guatemala City. SEE MY SONGS & Music a Chance for Change. For me it is important to integrate music into the work of NGOs and other organizations - also individual efforts - that help our World or the people in need. I believe Music has a lot to say and can be a great means to integration. In 2003 I founded M-CC: Music - a Chance for Change.